Usually this is the time of year when I have to come up with creative market-related topics to write about. Normally, when the kids get out of school and the weather turns hot, many investors take a break from the market. Summer months can be slow and boring if you’re typically an active trader. Often times during the summer, volatility will drop in stocks and other asset classes as the financial markets tend to drift sideways. There may be a little action around earnings, but that’s generally it. Low volatility can be a difficult time to trade options, especially when options trading volume is also low. However, this summer may be different than what we’re used to. The discord around international trade and tariffs could stir up uncertainty for the global and domestic economy. Uncertainty often leads to market volatility. First off, the US has already imposed steel and aluminum tariffs on Canada, Mexico, and the EU. Those tariffs have resulted in retaliatory tariffs (from the countries impacted) on a host of other products. It’s this sort of back and forth which leads to a trade war, which really isn’t good for anyone. However, the steel and aluminum tariffs may be a drop in the well compared to the tariffs expected to be imposed on Chinese goods. US administration is proposing $50 billion in tariffs on China, which could easily turn into more if China retaliates. Let’s also not forget that many US companies import goods and raw materials from China. In other words, a trade war with China would almost certainly hurt the US as much, if not more, than China itself. The market has been selling off whenever news hits regarding the tariff situation with China. I imagine we could see quite a few more down days if the issue escalates. Make no mistake, the stock market does not want to see a trade war. For the most part, it’s bad for everyone involved. 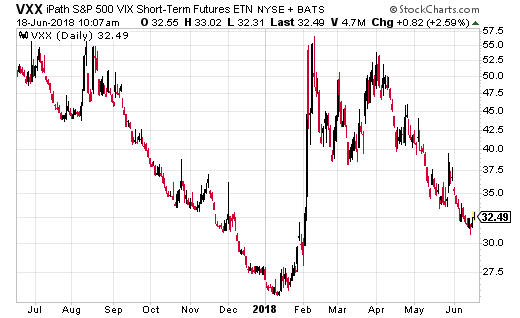 A size trader is perhaps preparing for the worse by using iPath S&P 500 VIX Short-term Futures ETN (NYSE: VXX) to protect or profit off of a rise in volatility through August. The trader purchased a very large call spread (with VXX trading at $31.70) which expires August 17th. The trade I’m referring to is the 45-60 call spread, where the trader bought the 45 calls and sold the 60 calls at the same time. The total cost of the trade was $0.71 and it was executed about 7,400 times. That works out to around $525,000 in premiums spent, which is also the max loss. Breakeven for the trade is $45.71. However, if volatility spikes and VXX shoots up to $60 or above, this position makes a small fortune. Max gain is over $10.5 million or roughly a 2,000% return! Now that’s hardly likely, but it’s pretty interesting to see such a small price ($0.71) resulting in such a huge profit potential. While a market crash isn’t likely, we definitely could see some real noise in stocks if the tariff situation with China and other countries continues to escalate. If macroeconomic risk concerns you, this VXX trade would be a really easy and relatively cheap way to protect your portfolio for the next couple months.